Some of the final objects selected for these blogs feature books that were part of John Curtin’s private library. Curtin loved reading, and loved libraries. He began buying books in his early working life, and borrowed from several libraries. Books he owned were kept by his family long after his death and became some of the first items acquired by the John Curtin Prime Ministerial Library. Object #47 The Camp connects Curtin the passionate reader with two of his life long friends, both noted authors in Australia. 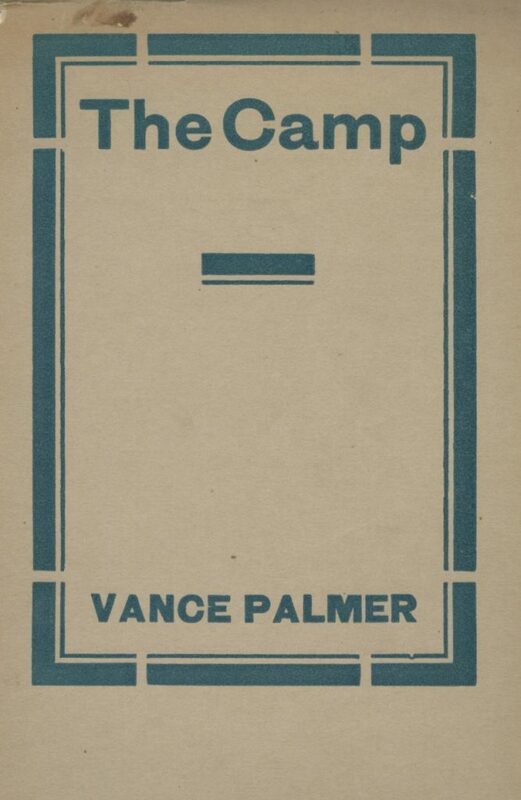 Written by Vance Palmer, JCPML00453/10 The Camp was given to the Curtins by Western Australians Hugo Throssell and his wife Katharine Susannah Prichard in 1920. While researching how the Curtins, Throssells and Palmers came to know one another we found a few other items connecting Katharine Susannah Prichard and the Curtins and decided to include those in this blog. Vance Palmer had been writing for publication since he was 16 when he and John Curtin met in 1909 while both were involved with the Victorian Socialist Party. For the next few years the friends pursued different pathways but by 1916 both Vance and John were active in the anti-conscription campaigns. At this time Vance and his wife Nettie were also friends with Katharine Susannah Prichard, and both the Palmers and Katharine were living in Emerald, near Melbourne. At the end of that year, John was sentenced to prison for refusing to attend military training. Despite his opposition to conscription and concerns about the war, Vance enlisted for service with the AIF in March 1918. He entered training camp, marched from town to town in Victoria during recruitment campaigns, then departed for France with the 14th Battalion, only to arrive three days after the armistice was declared. Even so, his experience as a soldier informed his poetry in The Camp. The anthology includes Vance’s best known poem A Farmer Remembers the Somme. 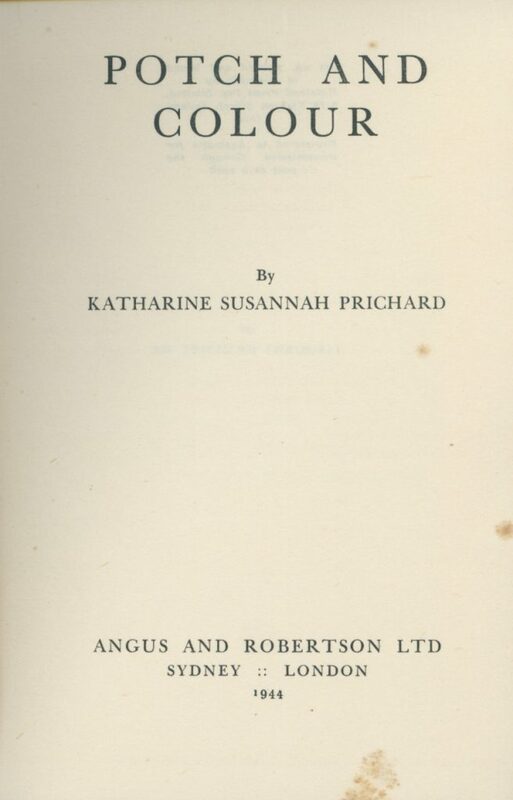 Katharine Susanah Prichard was also published at a young age, and was working as a journalist in London when she met war hero Hugo Throssell VC. They married in 1919, and Katharine moved to Western Australia to live at Greenmount in the house now known as the Katharine Susannah Prichard Writers’ Centre. In their first years together the Throssells commitment to social justice and the peace movement drew them into the same circles as the Curtins, and Katharine appeared frequently on platforms with John Curtin. Katharine also wrote occasionally for the Westralian Worker while Curtin was editor. The association between the Curtins and Katharine continued after Hugo’s death by suicide in 1933, as did Katharine’s friendship with the Palmers. 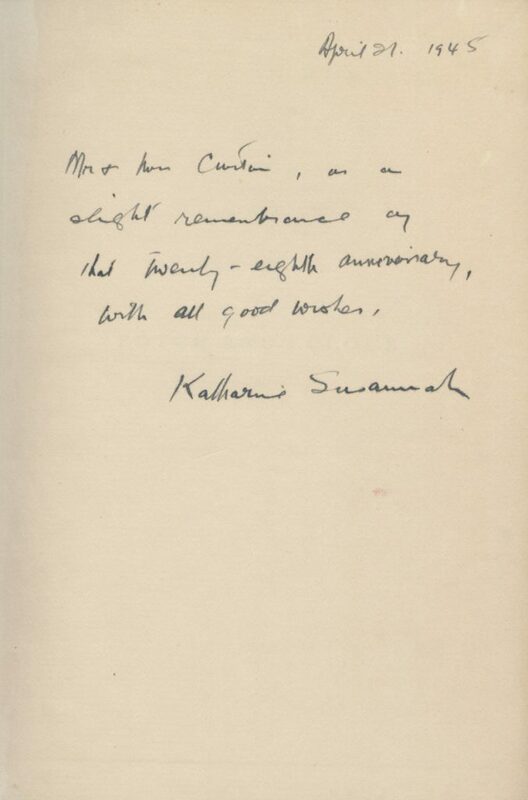 For the Curtins’ 28th wedding anniversary of 1945 Katharine gave a copy of her own book, JCPML00453/13 Potch and colour, 1944. A tribute to Elsie seems to have been written at the time, JCPML00398/125 Mrs Elsie Curtin by Katharine Susannah Prichard. The Curtins’ received personal visitors at the Lodge on April 21st and Katharine’s piece implies that she was there on the day. The JCPML collections hold one further item showing Katharine maintained contact with Elsie after John’s death in July of the same year. 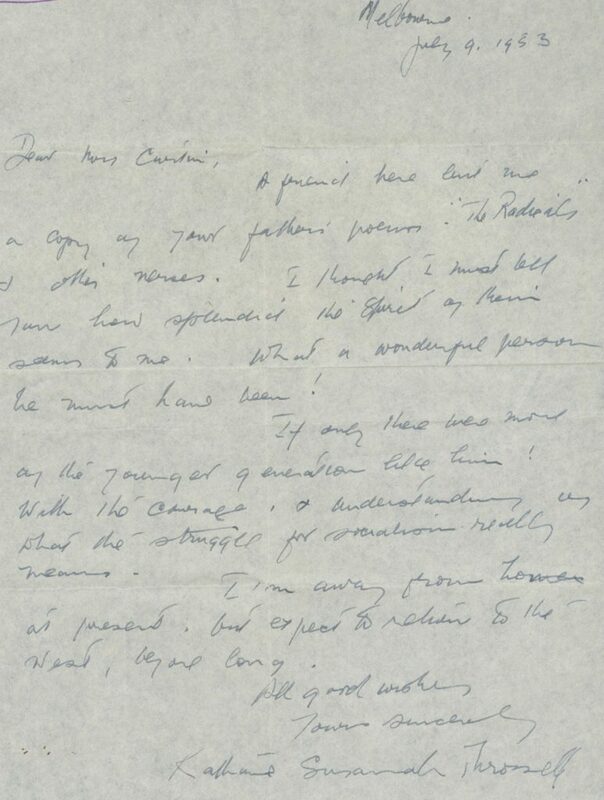 Inspired to write after Katharine read The Radicals and other verse by Abraham Needham, this letter of 1953, JCPML00399/12 is the last communication between Katharine and Elsie held in the JCPML collections. JCPML00398/125 is a four page tribute by Katharine Susannah Prichard. JCPML00399/12 The Radicals and other verse by Abraham Needham. 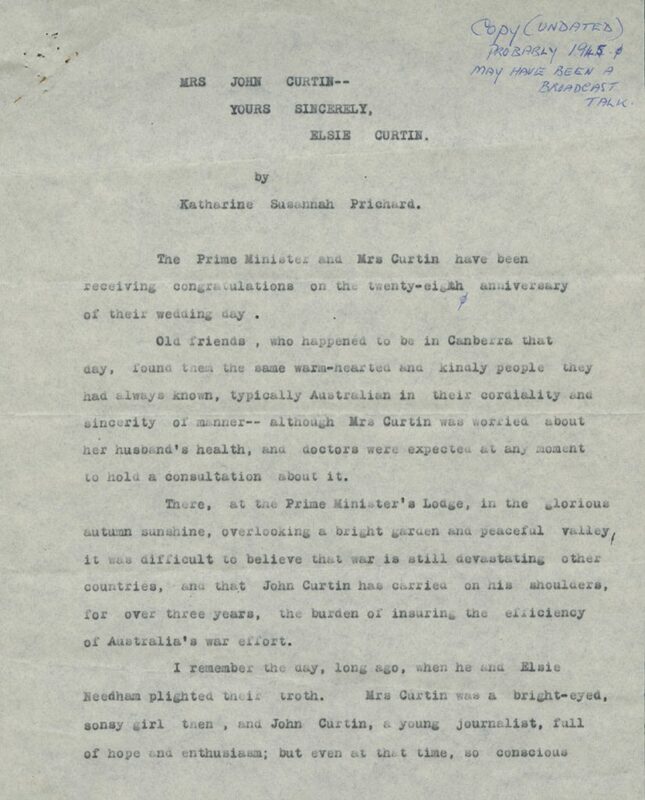 Elsie’s parents Abraham and Annie Needham arrived in Western Australia in the same year as Katharine but this letter to Elsie of 1953 indicates she had not met Abraham. Jordan, Deborah. (2007). Shaped on the Anvil of Mars: Vance and Nettie Palmer and the Great War. Australian Journal of Politics & History. 53(3). Next Next post: 48. The Pear Tree Dance Quilt, 1999.